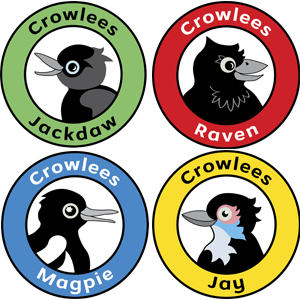 To help our children learn to work together across all year groups and to enable more opportunities for rewarding excellent behaviour, we are introducing the ‘Crowlees Houses’. The children are divided into four house groups across the school; Jackdaw, Magpie, Jay and Raven. Each ‘house’ will work together to gain merit points which are totalled at the end of each half term. The house with the largest total will receive a ‘house treat’, such as a non‐uniform day, or a film afternoon. Children will also be able to spend their own merit points on individual treats. Points can be spent or banked each half term, and points not used will be carried over to the next half term. Merit points can be spent on items in the Crowlees Shop. There will be a variety of items in the shop from small items such as pens, pencils, rubbers and key rings which will cost a few merit points, to items such as water bottles, toys and book vouchers which will cost more points.